Summer, 1311, and Sir Hugh Corbett has returned to the role as Keeper Of The Secret Seal, basically the royal spymaster, but now working for the dangerous Edward II. And not before time, as the King of France, Philip, is looking toward England once again. Philip has all but eradicated the Templar Order, primarily to seize their assets for himself, but small pockets are in hiding from him – and one such group is in a leper hospital in Queenhithe, London. But despite these men being trained soldiers, they are being killed one by one by an assassin who, it seems, faces no resistance. When one of the Templars is killed with a dagger stolen years ago during the robbery of the Crown Jewels Robbery of 1303. Richard Pudlicott has long been brought to justice by Sir Hugh – see Murder Wears A Cowl – but a large part of the treasure was never recovered. Why has one item resurfaced now? And are the deaths related to the tragedies occurring at sea – where the French warship The Black Hogge is somehow intercepting British ships at will? Sir Hugh finds himself up against his old enemy Amaury de Craon, but is someone else pulling the strings this time? 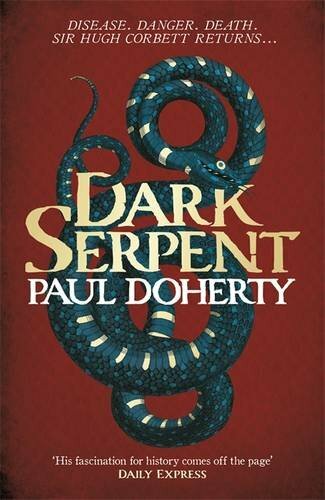 It was the Hugh Corbett book Nightshade that really switched me on to Paul Doherty’s work after Sergio pointed me in Paul’s direction. It was a breath of fresh air for me in the historical mystery field and it’s probably fair to say that while I enjoy virtually all of his work, it’s this series (and Brother Athelstan) that I look forward to most. Consistently entertaining mysteries with twisty plots with multiple strands that weave around each other until everything is sorted out, and usually with a lot of juicy murders along the way. This book, the first novel since The Mysterium six years’ ago, is no different. The various strands seem so distinct – the death of the Templars, the secret of The Black Cogge, the execution of two Templars years’ previously, the Crown Jewels Robbery… – but as things progress, everything dovetails nicely into one of the most complete plots that Paul has produced, with everything linking into the central tale in one way or the other, and with a well-hidden murderer. For the second time recently (more about the other occasion soon) I spent a good while assuming I knew who the villain of the piece was, but delightfully was utterly wrong. Silly me. Often, I find with Paul’s books that I’ve got a good idea as to who the killer as the finale approaches, but I had no idea this time. It’s a clever reveal, in fact, that I’d never have suspected. As ever, Paul’s strength, aside from the plotting, is in the vivid evocation of the time and place, with the scenes of Hugh’s surroundings leaping off the page. Whether it’s the final voyage of the doomed ship the Candle-Bright or the streets of Queenhithe, the detail is utterly absorbing while never distracting from the complex plot. I do have one niggle – the first chapter or so is pretty exposition-heavy, not all of it reading as smoothly as I might have expected – but once the story kicked off, I found myself carrying around my Kindle with the review copy (thanks to Headline, by the way) reading more at every opportunity. Needless to say, it’s Highly Recommended. I’ve read some books by Paul Doherty in the past, but your enthusiasm makes me want to seek them out (now I can find them more easily). Congratulations, an honour well deserved!